Enforcement and compliance is specifically mentioned in the Marine Life Protection Act (MLPA) and requires the MPA Management Program to include provisions for administering and enforcing MPA regulations in a manner that encourages public participation. 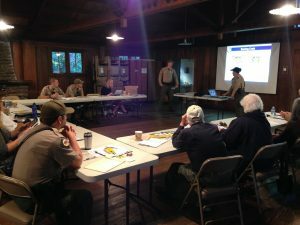 The bulk of the enforcement duties fall to the California Department of Fish and Wildlife Law Enforcement Division and they are actively seeking to continue to build partnerships and improve effectiveness. Compliance with regulations is directly linked to outreach and education efforts and the work of the MPA Statewide Leadership Team ensures a close coordination among members in these closely related areas.